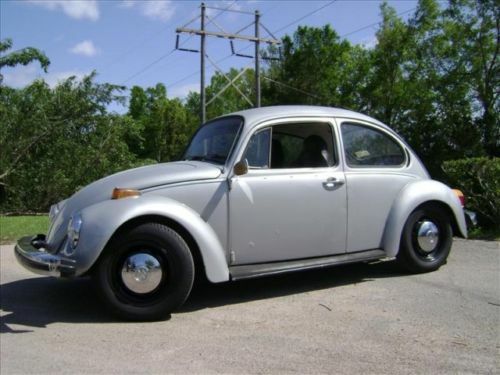 This 1974 VW Beetle has been converted to full electric. 100% green, emissions-free driving. (Yeah, yeah, coal-burning power plants produce emissions, but per unit of energy, they produce far less than a ’74 Bug.) Anyone who loves Mutter Earth should love this car. Hit the jump for more information about EV conversions and this little apparat. The idea of an EV conversion for normal street use has been around for several decades. 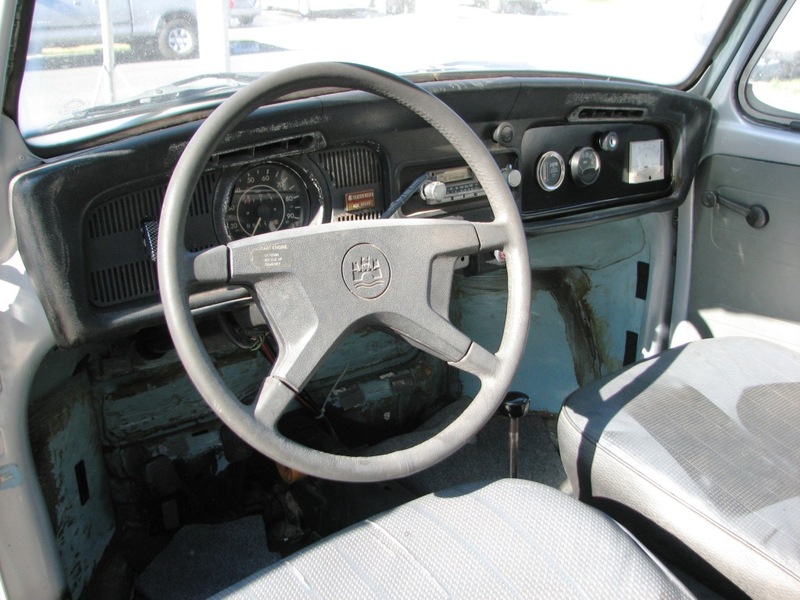 Many people have made perfectly reliable and viable vehicles that they use every day. There are some real advantages to electric cars too. They don’t require oil changes. A flat torque curve. They offer 100% of the available torque from zero RPM. They are very cheap to operate once they are done. The EV Beetle featured here is currently for sale on eBay. Click here to see the ad. The price is surprisingly low for a complete EV conversion. Unfortunately, the ad states that the car is not currently starting. 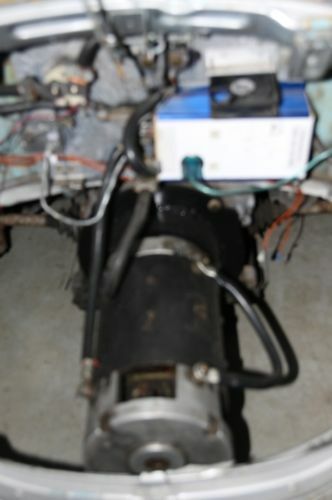 Probably won't start because the motor is so blurry. The fact that it isn’t starting leads me to the disadvantages of an EV conversion. They are non-standard, so Pep Boys won’t have parts. Components are expensive, very expensive. Batteries will only live for so many cycles, then will need to be replaced. Batteries are expensive to replace, especially when you have to buy 12 at once. The two biggest problems with batteries, however, is that they are heavy and they are bulky. 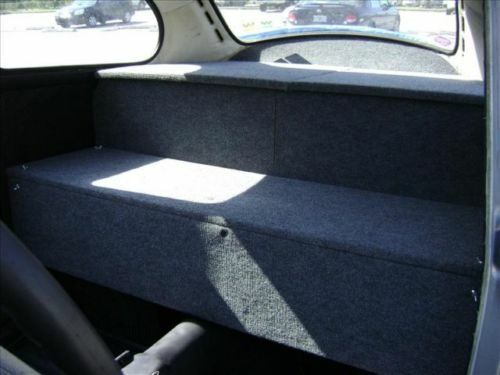 In this Beetle, most of the batteries have been encased in a rack that replaces the original back seat. In the first photo, you may notice that the rear of the car is squatting a little as well. The ad claims that no modifications were needed for the suspension, but perhaps it could use a bit of strengthening. Having said all that, I think this car would be a great starting point for someone who wants to get into an EV. Most of the heavy lifting is done and now it’s just troubleshooting. It used a 144 volt system with an Alltrax controller and an 8″ 21.7 HP motor (These aren’t the most expensive components, but not the cheapest either). The ad claims it was built by a group of engineers who assembled a service manual. The batteries haven’t been cycled much (a claimed 10 times), but they are 1.5 years old. 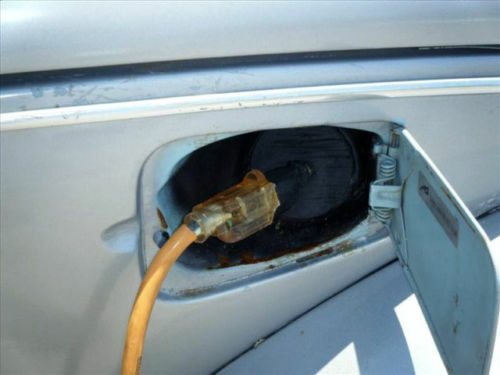 It also has an on-board battery charger – just plug it in to an extension cord. If one tried to build this same system in a D.I.Y. conversion, it would cost around $8-10,000 + a base car. So this one may well be worth diving into. With battery technology advancing at a record pace, it may be feasible to convert to Li-ION or AGM or the exciting new “Cambridge Crude” MIT battery in the near future. Or not. As it is, it would make a great little commuter. The claimed range is 60 miles, which seems a little inflated (I would guess it at about 40 in real-world driving.). This is the second time this car has been listed and the new Buy-it-Now price was lowered to $4,750 this time. Driving costs probably equate to something like 150 MPG in “fuel”. I punched those numbers into my calculator and it made a happy face! You need this car. This entry was posted in Custom, Imports (Euro), It's Electric!. Bookmark the permalink.